As you may have guessed from his name (pronounced lee-wah), this cat is native to China. 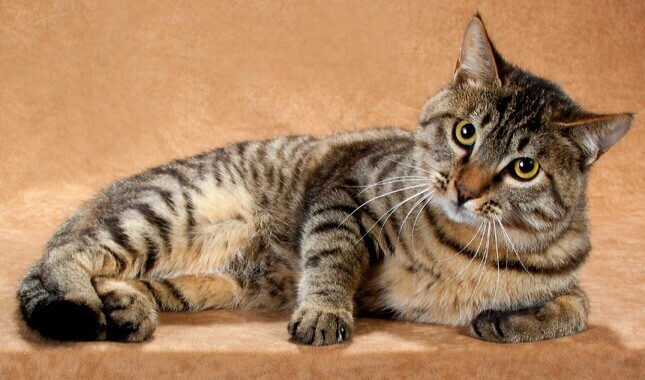 He sports a short brown mackerel tabby coat and usually weighs a solid 8.5 to 11 pounds or more. This is a smart cat who typically forms a strong attachment to people. A Li Hua stars in a television series produced in China. This attractive cat has a wide, diamond-shaped head and large, almond-shaped eyes of green (preferred), yellow or brown. He’s sturdy with a strong body, big paws and muscular tail. A tiny black spot on the corner of the mouth extends the line of the mouth, giving the impression that the cat is smiling. The breed’s purported agility is also described in the breed standard: “The Li Hua should be able to jump in the air and turn around twice before landing.” Get that cat a spot on an Olympic gymnastics team! The Li Hua is typically a people-loving cat with a great disposition. He can be a gentle and devoted companion to adults and respectful children alike. In his homeland of China, this cat is known as the Li Hua Mao and the Dragon Li. The Li Hua’s coat has ticked hairs: black at the root, lighter in the middle and brown at the tip. A Li Hua can take as long as 3 years to reach full physical maturity. Chinese owners have been known to hold weddings for Li Hua cats. We usually think of cats as having been domesticated in Egypt, but a recent archaeological discovery may place their domesticated beginnings in a surprisingly different place: China. According to a report in the Proceedings of the National Academy of Sciences, a study of cats living 5,300 years ago in the Chinese village of Quanhucun provides the earliest known evidence of a commensal relationship between cats and people, meaning they lived together compatibly. 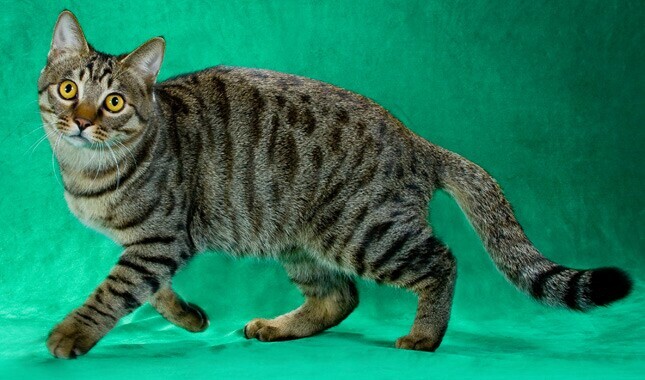 These early cats may have been the ancestors of the Li Hua. The cats are found throughout China and have been mentioned in old books and other written documents. Their job was to catch rats and protect crops and grain. The Li Hua is a natural breed, not the result of hybridization between two or more breeds. Although its origins may be ancient, the Li Hua as a pedigreed cat is relatively young. 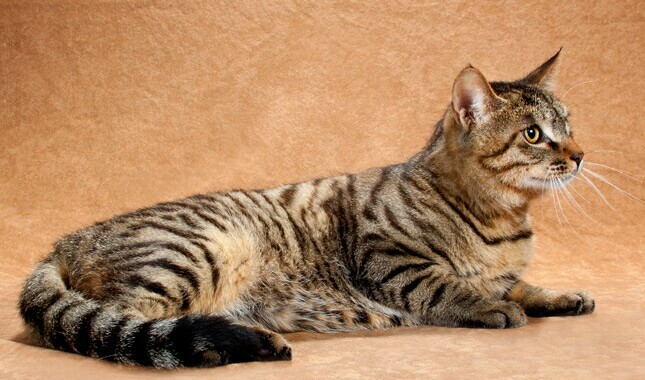 It was first exhibited as an experimental breed at a Cat Aficionado Association show in Beijing in 2003. The Cat Fanciers’ Association officially recognized it in February 2010, and it was shown in the miscellaneous class. Unfortunately, the breed did not cat-ch on, and the CFA no longer accepts the breed for championship status. Lively and brisk, the Li Hua has a reputation for being intelligent and friendly. He generally has a gentle disposition and acts as a family caretaker, not only of people but also other cats. He even tends to get along with dogs when introduced politely. How smart is the Li Hua? Chinese lore claims that one owner, Zhao Shangzai, trained his Li Hua to fetch the daily paper. The Li Hua is said to have a good memory and an analytical nature. In other words, he can figure things out, so you may have to work to stay a step ahead of him. Like most cats, the Li Hua will appreciate having an enclosed outdoor area where he can climb or lie out in the sun, but he shouldn’t be allowed to roam. All cats have the potential to develop a health problem, but currently no known breed-related diseases affect the Li Hua. Nonetheless, it’s a good idea to seek out a breeder who offers a health guarantee on kittens and who raises them in the home so they are well socialized and protected from diseases that could be picked up from free-roaming cats. Remember that after you take a new kitten into your home, you have the power to protect him from one of the most common feline health problems: obesity. Keeping a Li Hua at an appropriate weight is one of the easier ways to protect his overall health. The Li Hua has a short coat with no thick undercoat. Brush it weekly to keep the coat shiny, remove dead hairs and help prevent hairballs. The only other grooming the Li Hua requires is regular nail trimming and ear cleaning. Brush his teeth often with a vet-approved pet toothpaste and schedule veterinary dental cleanings as needed. Start brushing, nail trimming and teeth brushing early, so your kitten learns to accept these activities. Whether you want to go with a breeder or get your cat from a shelter or rescue, here are some things to keep in mind. First things first: This cat is extremely rare in the United States. Don’t count on being able to acquire one without a long wait. You may even have to import one from China. If you are bringing a cat or kitten back from China, he will need to have an International Health Certificate from a veterinarian stating that he is healthy and in good condition to be transported by air. This form is not required for entry into the U.S. but may be required by the airline or by certain states. The cat may also need a valid rabies vaccination certificate unless he is from an area that is considered to be free of rabies, is younger than 4 months or is traveling to a state that does not require the vaccination. The vaccine should be given at least 30 days before departure. With the exception of Hawaii and Guam, there is no quarantine for pets arriving in the U.S. from overseas. You may be required to fill out a form or present your paperwork at customs before departing with your cat. Your cat may also be inspected on entry and can be refused if he shows signs of infectious disease or other illness. You want your Li Hua to be happy and healthy so you can enjoy your time with him, so do your homework before you bring him home. Put at least as much effort into researching your kitten as you would into choosing a new car or expensive appliance. It will save you money and frustration in the long run. Many reputable breeders have websites, so how can you tell who’s good and who’s not? Red flags include kittens always being available, multiple litters on the premises, having your choice of any kitten and the ability to pay online with a credit card. Those things are convenient, but they are almost never associated with reputable breeders. Whether you’re planning to get your feline friend from a breeder, a pet store or another source, don’t forget the adage “let the buyer beware.” Disreputable breeders and unhealthy catteries can be hard to distinguish from reliable operations. There’s no 100% guaranteed way to make sure you’ll never purchase a sick kitten, but researching the breed (so you know what to expect), checking out the facility (to identify unhealthy conditions or sick animals) and asking the right questions can reduce the chances of heading into a disastrous situation. And don’t forget to ask your veterinarian, who can often refer you to a reputable breeder, breed rescue organization or other reliable source for healthy kittens. Before you buy a kitten, consider whether an adult Li Hua might be a better choice for your lifestyle. Kittens are loads of fun, but they’re also a lot of work and can be destructive until they reach a somewhat more sedate adulthood. With an adult, you know more about what you’re getting in terms of personality and health. If you are interested in acquiring an adult cat instead of a kitten, ask breeders about purchasing a retired show or breeding cat or if they know of an adult cat who needs a new home. The Li Hua is not your everyday shelter cat, but sometimes a pedigreed cat ends up at a shelter or in a foster home after losing his home to an owner’s death, divorce or change in economic situation. Sites like Petfinder and AdoptAPet.com can have you searching for a Li Hua in your area in no time. The site allows you to be very specific in your requests (housetraining status, for example) or very general (all the Li Hua available on Petfinder across the country). AnimalShelter.org can help you find animal rescue groups in your area. Social media is another great way to find a cat. Post on your Facebook page or Twitter feed that you are looking for a specific breed so that your entire community can be your eyes and ears. Start talking with pet pros in your area about your desire for a Li Hua. That includes vets, cat sitters and groomers. When someone has to make the tough decision to give up a cat, that person will often ask her own trusted network for recommendations. Networking can help you find a cat that may be the perfect companion for your family. Most people who love Li Hua love all Li Hua. That’s why breed clubs have rescue organizations devoted to taking care of homeless cats. You can also search online for Li Hua rescues in your area. What is his energy level like? Wherever you acquire your Li Hua, make sure you have a good contract with the seller, shelter or rescue group that spells out responsibilities on both sides. Petfinder offers an Adopter’s Bill of Rights that helps you understand what you can consider normal and appropriate when you get a cat from a shelter. In states with pet lemon laws, be sure you and the person you get the cat from both understand your rights and recourses. Kitten or adult, take your Li Hua to your veterinarian soon after adoption. Your veterinarian will be able to spot problems and work with you to set up a preventive regimen that can help you avoid many health issues.